It’s a bumper haul today at The Lego Car Blog, thanks to Tim Henderson and his wonderful collection of retro-futuristic hover cars. Loosely based on all manner of classic American machinery, Tim’s hover car concepts update their historic counterparts with a whole lot more vertical ability. Models include a Buick Skymaster (apt name!) station wagon (pictured above), a pair of Pontiac Grand Prix (pictured below) and Mercury Meteors (more apt naming!) (top), and a very cool Blacktron-esque Dodge Charger and Chevrolet Caprice (bottom). There’s more to see of each build, all of which contain a mini-figure and some delightful detailing, plus many more besides, at Tim’s ‘Hover Car’ Flickr album. Click on the link and leave gravity behind! *Today’s title song, which has instantly made this blog 37% classier. If you’re going to tow a shed with wheels behind you to a field where you have to crap in a bucket, you may as well do it in something cool. This 1956 Pontiac Catalina certainly fulfils that brief, and the dinky caravan in tow doesn’t look too bad either. See more of both courtesy of LegoEng on Flickr. 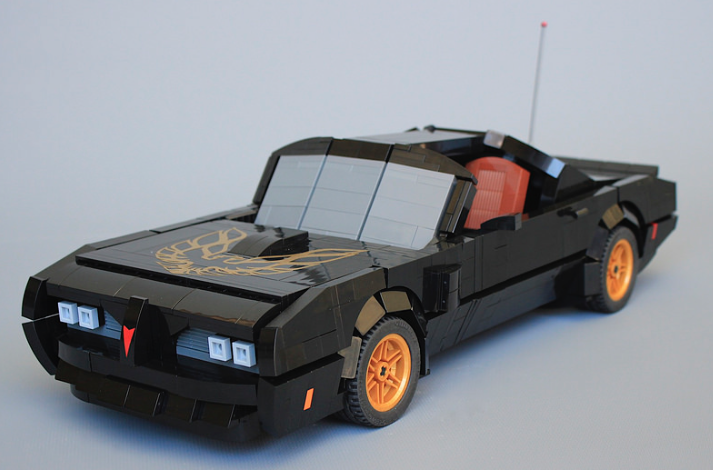 This is not the best looking recreation of Knight Rider’s KITT (that accolade belongs here or here). But KITT’s genius wasn’t found in the way that it looked, but in what lay hidden inside. 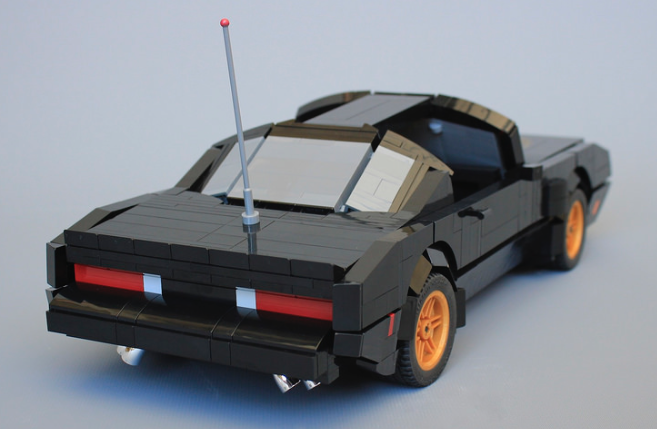 This is Gabor Horvath’s remote controlled KITT, and what’s underneath is a simply astonishing piece of Lego engineering. Gabor’s KITT contains six Power Functions motors, the first being a Large motor driving the rear wheels through a differential, and the second being a Servo motor for steering. The remaining four motors are all needed to give the model KITT’s most recognisable feature; its lights. Up front a set of pop-up headlights are controlled via a Medium motor, whilst another Medium motor switches them on. Sitting in-between these is KITT’s scanner, which oscillates back and forth via an ingenious linear-actuator operated mechanism. It’s a properly clever solution, which Gabor has detailed through a series of images and in a neat video. See full details of how it all works via Gabor’s MOCpage, Flickr photostream or at the Eurobricks discussion forum. America is just about emerging from the automotive wastelands it’s been occupying since the late 1970s. Sadly though, Pontiac didn’t survive its stay in the wilderness, dying alongside such names as Saturn, Oldsmobile, and Eagle. But Ralph Savelsberg hasn’t forgotten Pontiac. His recently updated and totally beautiful 1965 Bonneville reminds us of a time when the American car wasn’t a fat joke, and ‘Aztek‘ only referred to an ancient civilisation in South America. You can see more of his glorious tribute to old-school Americana on Flickr – click here to take a trip to ’65. This blue beast is a 1966 Pontiac Bonneville Coupe, with a few modifications courtesy of the inside of Lino Martins‘ head. A chop to the roof and ground-scraping lowered suspension accentuate the already ridiculous proportions of the ’66. It’s been built for the 99th LUGNuts challenge on Flickr, and with the 100th just a few weeks away we’re expecting something pretty special to celebrate… We’ll bring you more details of the 100th LUGNuts challenge soon, but in the meantime you can check out the 99th and Lino’s entry via the links above. Breaking Bad is, according to everyone who’s ever watched it (including this TLCB writer), the best thing that’s ever been on TV ever. The Pontiac Aztek however, is widely considered to be one of the worst vehicles ever made in the history of the automobile ever. These two hyperboles met when some brilliant automotive casting matched the early 2000s crossover with Breaking Bad’s lead character Walter White, aka Heisenberg (before the show’s success attracted some blatant vehicle product placement). Whist we thoroughly agree with the first statement above, the second we’re not so sure about. The Aztek was of course a spectacular failure, derided for both its function and aesthetics. But… much of what made the Aztek such a joke back in 2001 is now completely on trend. Spilt headlights, cross-over profile, and coupe-like rear glass are now all common-place in the burgeoning crossover segment, with everyone from Nissan to Mercedes using one or more elements of the Aztek’s design in their latest products. It’s all too late for Pontiac though, which was closed down by parent company GM shortly after the Aztek ceased production. However, in a strikingly similar repeat of another star-car failure, the Aztek has seen a resurgence in popularity as a used buy, mostly due its starring TV role. It may even become a future classic. 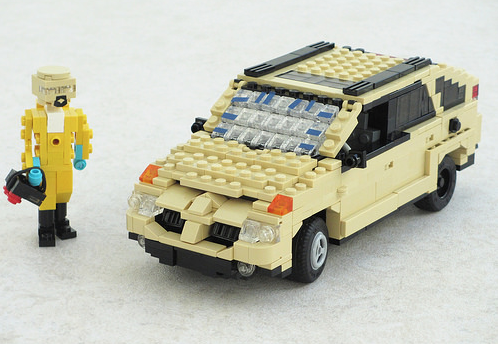 The perfect recreation of Walter White’s battered Pontiac Aztek shown here is the work of serial bloggee Ralph Savelsberg (aka Mad Physicist), and you can see all the photos of his latest TV car at his photostream via the link above. Ralph Savelsberg continues his fantastic run of movie cars with an epic from 1977 – the famous black n’ gold Pontiac Trans-Am from ‘Smokey and the Bandit’. Brick Reynolds makes an appearance too. Get Eastbound and Down on Flickr at the link above. Chris Melby’s huge 1975 Kenworth 900 A truck from the cult film ‘Smokey and the Bandit’ featured here at TLCB earlier in the month, and he’s now completed the second star vehicle from the movie; the Bandit’s 1977 Pontiac Firebird Trans-Am. Chris’ Model Team replica of the famous American muscle car uses some ingenious building techniques throughout, not least the glass, wheel-arches, front air-dam and side sills. There’s lots more to see on Flickr – click the link above to join the journey. Possibly the greatest TV show of recent times is back (sort of) with the arrival of the new spin-off ‘Better Call Saul’. 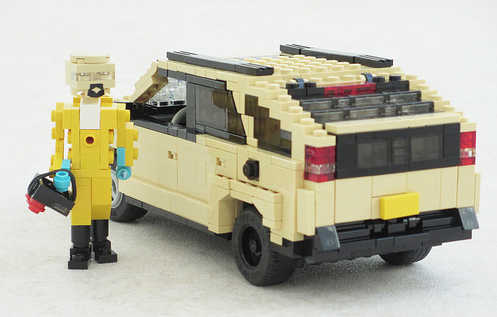 Here at TLCB though, we’re all about the original – and what better way to remind ourselves of the five seasons of brilliance than with two of Breaking Bad’s most infamous vehicles; Walter White’s Fleetwood RV meth lab, and his hideous (and perfectly cast) Pontiac Aztec. Both of the Miniland-scale Lego recreations in this post have been built by Stephan Sander, and they can be viewed in more detail on either MOCpages or Flickr. The world… of the Knight Rider. Probably both the coolest and cheesiest TV series ever made Knight Rider arrived on our screens in 1982, running for four glorious – although some might say ridiculous – years. The star of the show was of course the artificially intelligent Pontiac Trans-Am ‘KITT’, a self-aware and nearly indestructible force for good, driven by a crime-fighting David Hasselhoff. This superb Model Team recreation of the Knight Industries Two Thousand is the work of Flickr’s Alex Jones aka Orion Pax, and he’s published an extensive gallery of top quality photos at his website. Click the link above to visit Alex’s Flickr page where you can be re-routed to the full set of images. Much of the online Lego community know of the legendary Firas Abu Jaber, and most will have a favourite or two of his creations. 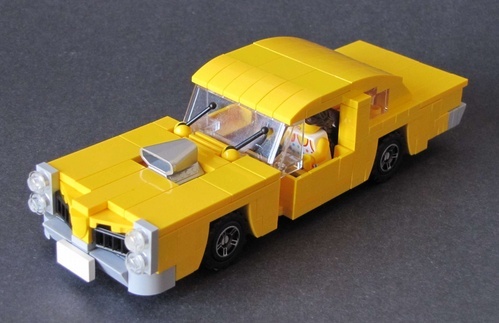 Here at Head Turnerz we have teamed up with The Lego Car Blog to give you another HT x TLCB Top 5, this time to showcase the very best of what Firas built over several incredible years. In fifth place is, without doubt, the best recreation of the iconic Mitsubishi Evolution X that you’ll ever find made from LEGO. We remember when we first saw Firas’ creation posted on the MOCpages home page – and we nearly fell off our chairs. With 15 stud wide body work and ingeniously recreated disc brakes Firas’ Evo is jam-packed with details, making it not just one of the best Evos, but one of the best Lego cars ever made. What sort of Top 5 of the best Firas cars would this be without one of his famous Lamborghinis? Coming in at number four is this stunning Lamborghini Gallardo SE built way back in January 2009. 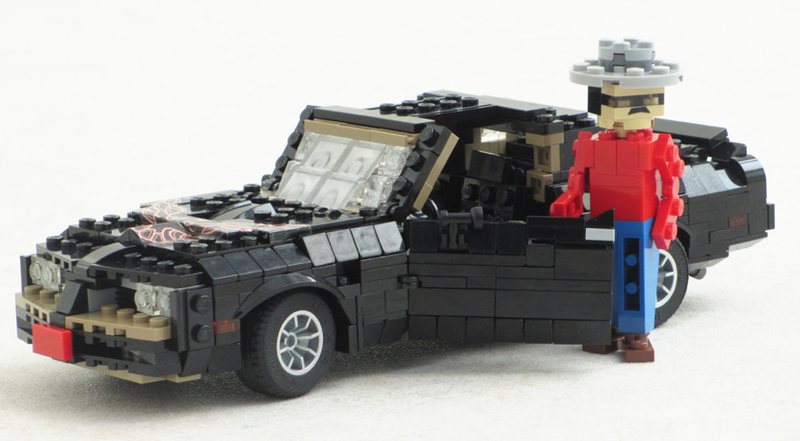 The body shaping is – as with every Firas build – perfect, and with the freakishly great eye for detail that he has, this Lego Lamborghini does not let the famous marque down. K.I.T.T could possibly be the most well known T.V/movie car of all time and Firas did not disappoint when he ‘dropped’ this one, again back in 2009. Firas’ model features everything the real ‘82 Pontiac Firebird Trans-Am K.I.T.T had, including the infamous scan-bar. Of course, everything opens, including removable T-tops to complete the convertible roof! The Pagani Zonda C12 S is one of the most beautiful Italian cars ever made, Firas somewhat cheesily describing it as “just like a beautiful girl”. We can see what he means though, and his Model Team version is just as eye-catching. The curves, his unique building techniques, and those remarkable headlights – it’s how a Lego car should be built. Firas even constructed his Zonda so that all the ‘elements’ were detachable – see how he did it at the link. Taking the top spot in our Top 5 Firas Abu Jaber creations list is none other than his incredible Ford GT – possibly the greatest Model Team car ever made, and the most popular car in the history of MOCpages. Some may disagree with our previous choices, but we think we that all will agree that this is the car that cemented Firas’ reputation as the best Lego vehicle builder of his time. A legend if you will. This GT was so realistic it was even featured on the official Top Gear website! It’s the perfect MOC. So that’s Head Turnerz’ Top 5 Firas Abu Jaber creations. Do you agree with their choices or has your favourite missed the cut? Let them know what you think by joining in their discussions over on Flickr – click here to visit the group, and they’ll join us again soon for another Top 5.